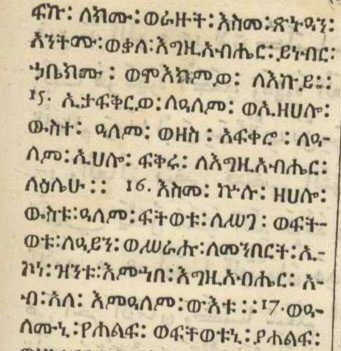 It occurred to me that it’s been a while since we’ve looked at any Gǝʿǝz texts, so here are few lines with vocabulary and English translation for some saints (chosen relatively randomly). 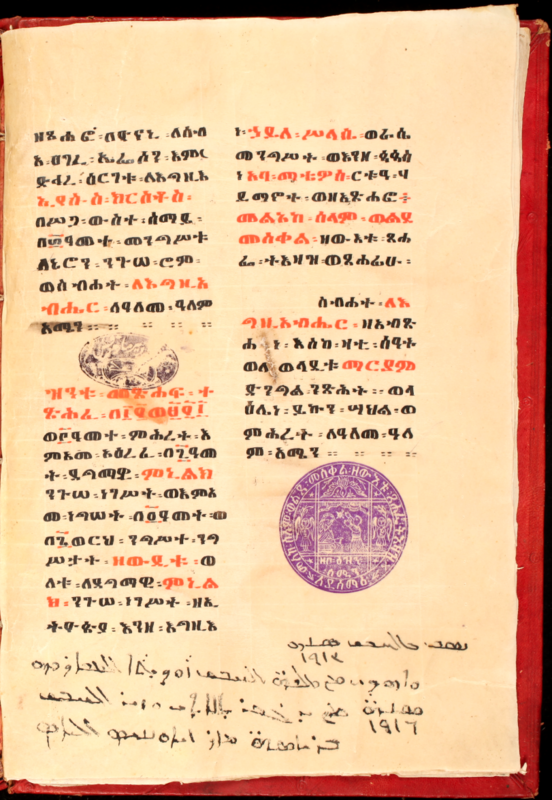 These are sälam-verses, the five-line rhyming poems that occur in the Ethiopian synaxarion. These famous female martyr-saints named after the virtues are often, but not here, named with Wisdom/Sophia (BHO 1082-1085; cf. here). And the smoke did not cloud their beauty. The sälam is straightforward in its details, but it is a good example of how the Gǝʿǝz word order can be moved around in this literary form. This Matewos celebrated here is associated with the conversion of the sibling saints Behnam and Sara. To the point that he clothed himself in fleece like a sheep! And there cleansed of leprosy the flesh of Sara. The saint, a soldier, is said to come from Ašmūn Ṭanāh. His Christianity was revealed to a ruler. With others he confesses his Christianity before this ruler, who then gives them a chance to renounce their faith and to sacrifice to the gods: they don’t, and tortures ensue, which the saint survives. As for Abba Bikabes, he tortured him severely and much: he chained him with iron, put on the torture wheels, hung him upside down, and cut his limbs. Reviling the idols of the peoples and their lawless king! As they cut his flesh with an axe. *For both toponyms mentioned here see Amélineau, Géographie, p. 88; (and note the story for John of Ašmūn Ṭanāh there; cf. p. 170 and 457). Today (Aug 19) some churches celebrate the Transfiguration, and there are readings for the feast in published synaxaria in Arabic, Armenian, and Gǝʿǝz. A close reading and comparison of the language of these texts would be worthwhile, but now I’d like only to share part of the Gǝʿǝz reading, namely the three sälam verses that close the commemoration of the Transfiguration. (On the genre of the sälam, see this post.) 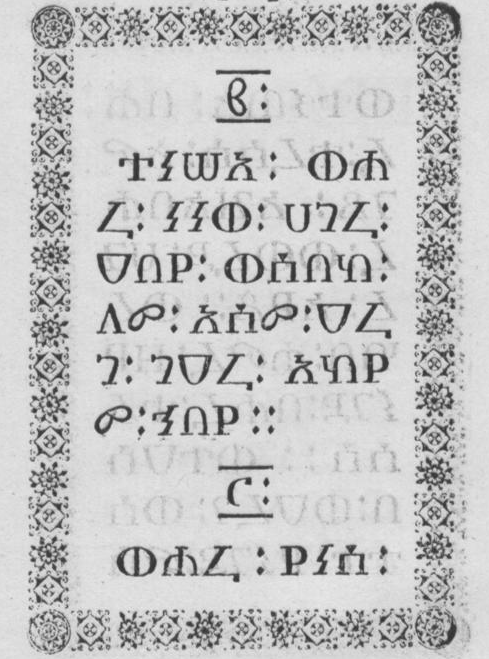 Most typically, there is only one five-line verse in the Gǝʿǝz synaxarion at the end of the commemoration of a saint or holy event, but for this important feast there are three together, the verses ending, respectively, with the syllabic rhymes -ʿa/ʾa, -wä, -se. As usual, verses like this provide a good learning opportunity for students interested in Gǝʿǝz, both in terms of lexicon and grammar, the latter especially thanks to the freer arrangement of the sentence’s constituents that obtains in this kind of writing. I give Guidi and Grébaut’s text from PO 9: 513-514, together with a new, rough English translation. The fertile mountain and the firm mountain! There Barak conquered, and the might of Sisera was conquered. He revealed the hidden mystery of his second coming. Greetings to your ascent up the slope of Mount Tabor in tranquility! And your clothes were as white as snow. And the Spirit of holiness concealed your head. You, Son, showed the trinity of your divinity. 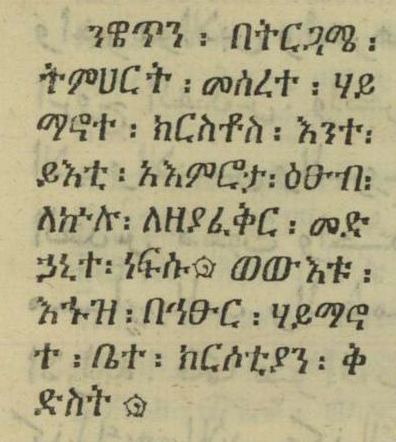 The two prepositions in this line behave more like adverbs than prepositions, given that a relative pronoun pointing back to ክናሴ፡ in the previous line is omitted: “assembly at [which] Elijah was present and with [which] Moses was.” Cf. Dillmann, Gr., § 201. The manuscript is not particularly significant for its content or age, and, while colophons often supply us with otherwise unknown prosopographic details, that’s not the case here. It is, however, at least of mild interest because of the presence of a Garšūnī note in a Gǝʿǝz manuscript, for what that note says, and because of this copy’s peculiar place in an otherwise Syriac and Arabic collection. 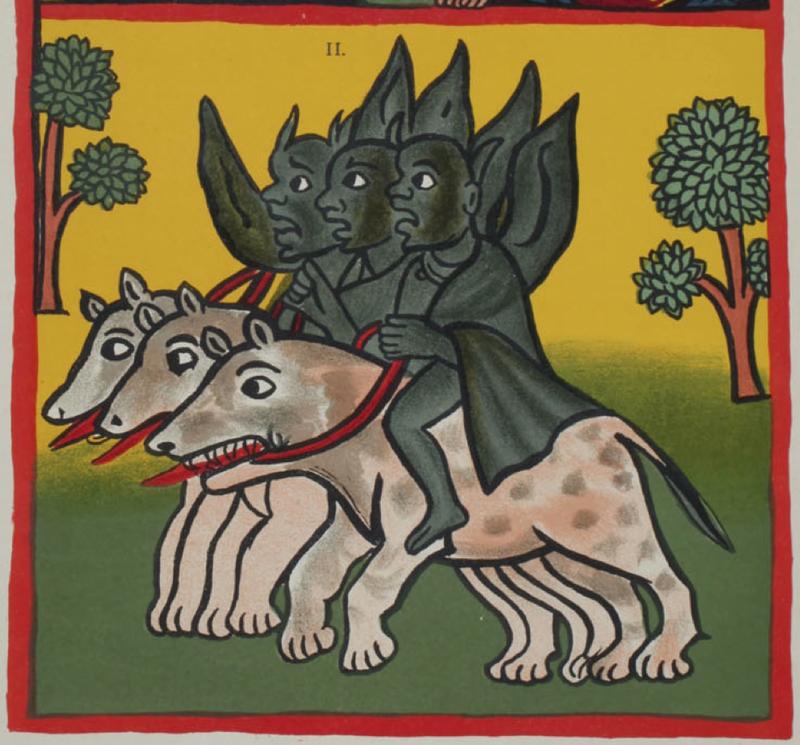 If any other unusual settings of manuscripts within particular collections come to mind, feel free to point them out in the comments. By virtue of my work at HMML, I work most closely with manuscripts, and it’s not infrequent that I find myself well reminded of how important it is to stay closely familiar with manuscripts over against printed editions for one reason or other, but I nevertheless have no trouble finding both interest and beauty in printed texts (and unfortunately also ghastliness!). And there are times when a printed text is the only witness to a text one has access to! We are, I believe, richer in these cases from the standpoint of paleography than of typography. 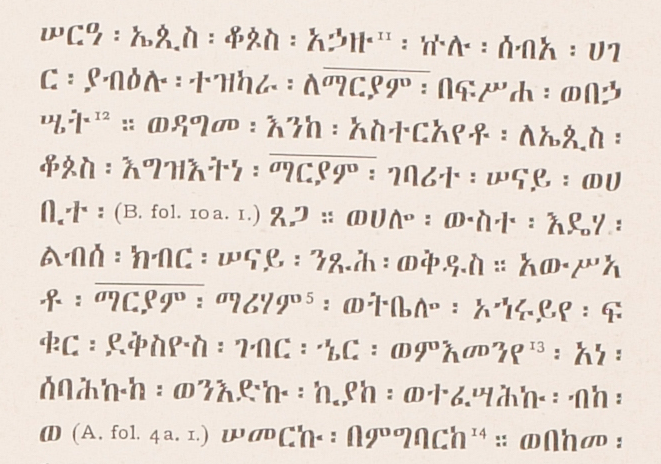 So, too, with Gǝ`ǝz: we have Siegbert Uhlig’s Äthiopische Paläographie (Stuttgart, 1988), and its much slimmer English cousin, Introduction to Ethiopian Palaeography (Stuttgart, 1990), but there is no Ethiopic counterpart to Coakley’s book mentioned just above. There are, by my unscientific estimate, less printed data to go on for Gǝ`ǝz than for Syriac, but there is still plenty to be of interest. Here I only give a kind of mini-gallery of some printed texts, some from screen captures of digital images and some from photos of books at HMML, but a proper presentation would also naturally include the history of the type used in this or that printing. These examples go from 1654 to 1900. 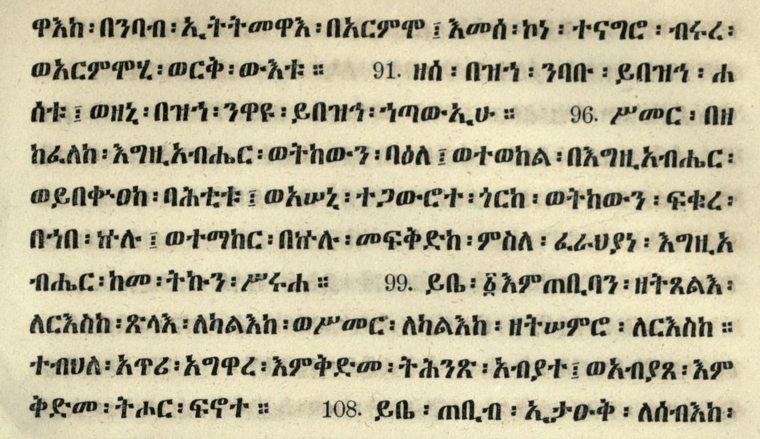 We could also look at texts published after this time period, such as in PO, CSCO, and Aethiopica, but the typography of these publications is not appreciably different from the examples below from Dillmann’s Chrestomathia and Budge’s Miracles.